By Mom of a car fanatic! I purchased this for my son who is a fanatic about keeping his Camaro clean!! He loved it! The dolly raises it up to a great height and the grit guard is perfect. Being able to push it around is much more convenient than picking up a 5 gallon bucket. The only thing that would make it better would be a seat. I really like the two wheel locking device since on my driveway has a slight decline. 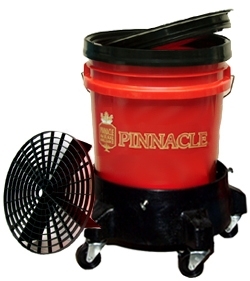 I also like the filter device in the bottom of the bucket and the ability to roll the bucket. AS ADVERTISED, "NOT YOUR EVERDAY BUCKET". WORKS WELL & AS ADVERTISED! This is not your average home depot 5 gallon bucket. Lid screws on nice. Great quality. Casters and dolly is of high quality too.